There are shopping and dining options within minutes of the Town of Seven Devils, with several being in Town limits at the Shoppes of Tynecastle. Dining features the popular barbecue restaurant The Pedalin’ Pig, a name that reflects the great mountain biking found in the area. Eat inside the log restaurant’s warm dining room or bar, or in summer months sit outside beside the splashing waterwheel. Nick’s Restaurant and Pub is in the Shoppes area, a popular gathering and dining spot. There’s an indoor bar and dining room seating for informal fare, and outdoor seating too. A few storefronts away, Valle de Bravo Mexican Grill has a complete menu of South-of-the-border specialties. 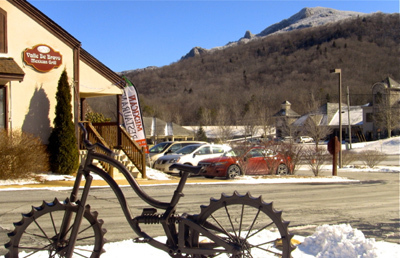 Outdoor seating boasts spectacular views of Grandfather Mountain in the warmer months. A McDonald’s is across the highway. 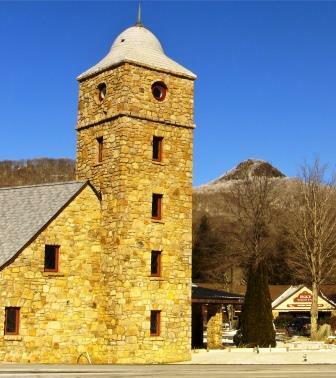 The Shoppes at Tynecastle feature a diverse collection of one-of-a-kind shops, and an Avery County visitor center for complete information on the area. Next door, Headquarters Bike and Outdoor has mountain bikes for rent and sale, and a complete maintenance facility. Flora Ottimer is an upscale children’s shop with toys, clothing, and a diverse range of merchandise. Ken Blackburn's Rustic Rooster features high-end men's fashions, especially shirts, one-of-a-kind antiques, imports and custom made furniture. Visit our Business Directory to view the shops websites or contact them with questions. All the essentials are here or close by. A Rite-Aid Drug Store is beside Valle de Bravo. Just across the road is the High Country ABC Store, which Seven Devils is a part owner of. There is a Speedway station at the base of Seven Devils Road, with all of your basic essentials in case you cannot run to a grocery store. If you need more than the essentials, grocery stores and other shopping areas are just miles away from Seven Devils, as the central location to both Boone and Banner Elk make us a great place to settle for a vacation stay any time of the year! Below is an aerial view of the Seven Devils section of Tynecastle, where our shopping and dining locations are.